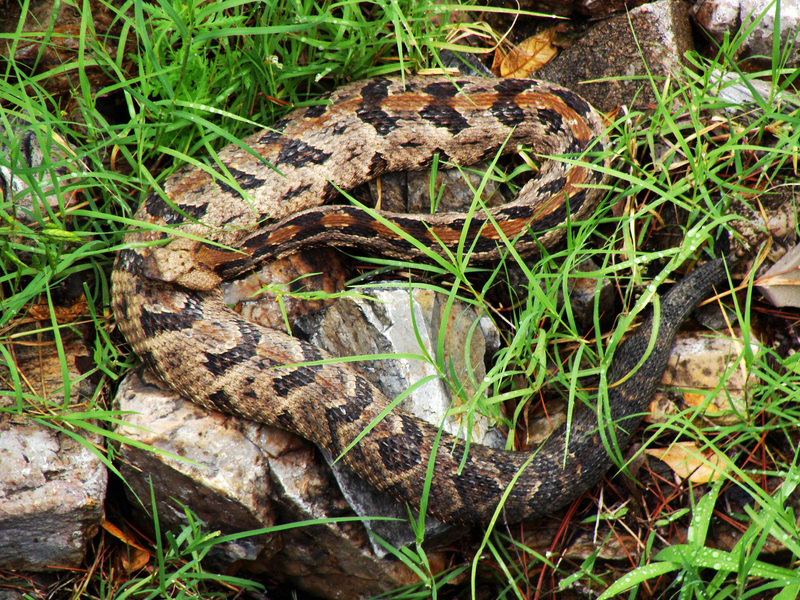 We know living where we do that venomous snakes are just part of the package. We’ve seen or heard copperheads and diamondbacks on occasion, but not in our yard. Not ’til a couple of weeks ago that is. We know we have snake burrows under the front porch which house nonvenomous long Eastern coachwhips and hognose snakes. So looking down off the deck, there was a new snakeskin pattern coiled in the grass. “Hey!” I yelled to my husband. “We’ve got a new snake and I think he’s venomous!” He spotted the rattle — and right then we had our first timber rattler — or at least the first one we know of. Timber rattler curled up in a warm spot on the south side of the house. There’s a trio of waist-high holly bushes on the property that never seem to fill out; never seem to outgrow the term “misshapen.” Over the years we began to realize that all the pruning in the world wouldn’t help them achieve any sort of suburban landscape symmetry. Why? Because the deer do all the trimming, browsing tender leaves and leaving discards all over the front porch. Earlier this month, we found the hollies supported another life — a tiny cup of tightly woven pine needles bearing three marble sized-eggs. Last night, we discovered the eggs had given way to tiny birds. 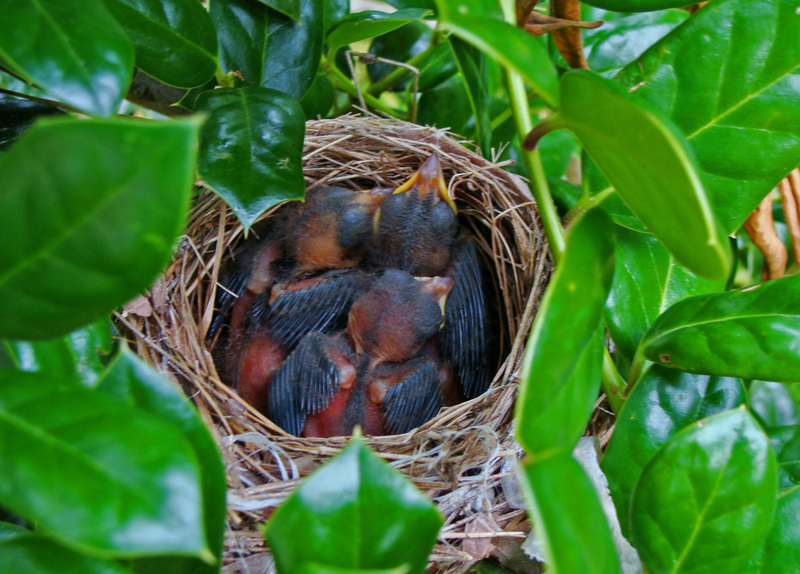 Blind and almost featherless with their oversized yellow beaks straining upward for motherly fare. Cupful of babies — Tiny birds wait on mom to bring some breakfast. Taken June 14, 2015. 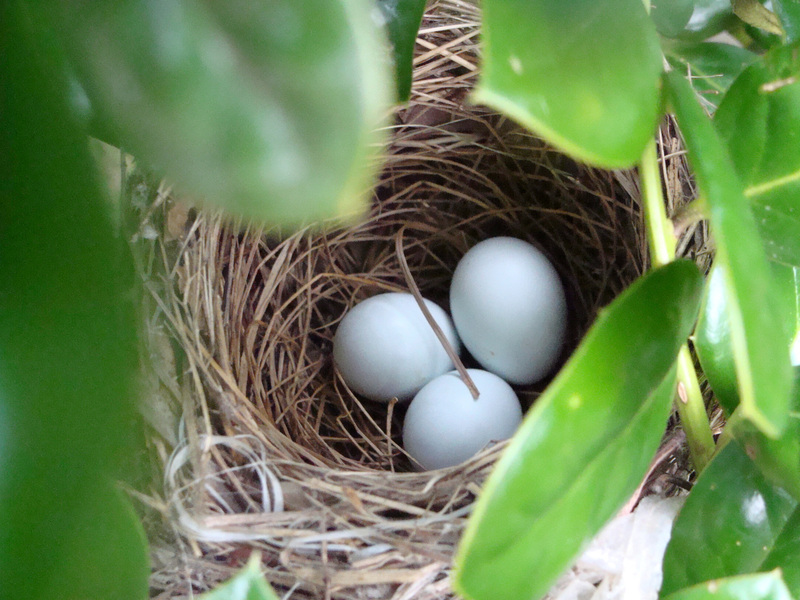 Three eggs carrying precious life — taken June 6, 2015.